Once again we ventured to the cinema on an unsubtitled adventure. The session screening time had been changed a couple of times due to various delays with the film’s release. So it came as no surprise at all to still be waiting for the 9:30pm show to start at 11:00pm! We eventually staggered out of the theatre at 2:00am. Bear that, and our language issues in mind as we try and unravel Komaram Puli. The crowd reaction was amazing. In the hour or so we were waiting, we had ample opportunity to perfect our Pawan Kalyan chants. The crowd favourite was “Twinkle twinkle little star, Pawan Kalyan Powerstar!”, and the roof almost came off before the film even started! Not understanding Telugu wasn’t going to be an issue for this film, as there was no way we were going to be able to hear any of the star dialogues. The crowd started cheering, screaming, even crying, as soon as the credits began to roll and it didn’t stop. Some fans had carefully pre-cut strips of paper to hurl in the air at key moments, other more spontaneous types just tore up newspapers as the spirit moved them. 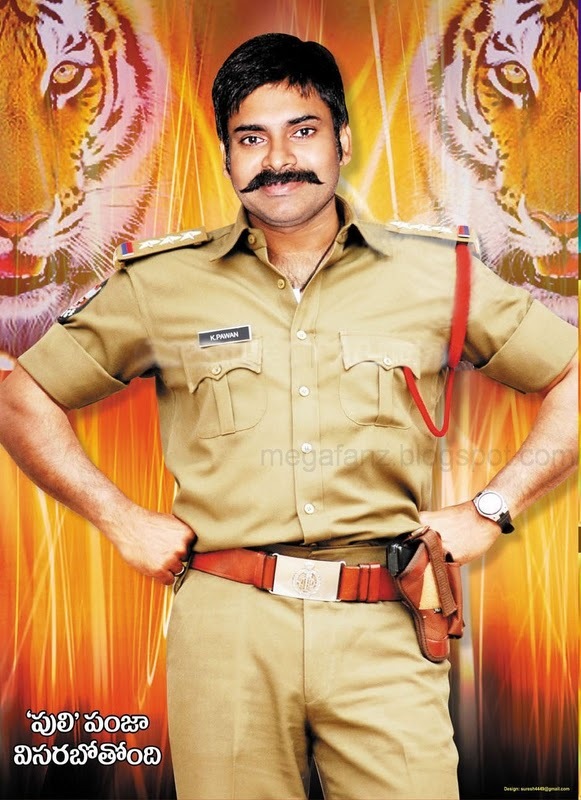 A charismatic, dedicated and honest policeman – Komaram Puli – who vows to take on crime and corruption. We never had a hope of getting all the detail of the very fast talking Puli’s dialoges but we believe it went something like “I swore an oath to serve my country and its people without fear or favor. Some of you are a disgrace to the uniform and could afford to shed a few kilos. Get your act together, sit up straight or I will take you down”. Or something. Anyway – he is a good cop struggling with a police force that is at best lazy, and at worst corrupt. For all his talking he is a man of action – the opening action sequence featuring Pawan Kalyan and some excellent product placement is packed full of thrills and stunts that had the audience going wild. Now, answer this question. You have a terrorist with a bomb strapped to his body. You can kill him by dropping him from a helicopter, shooting him or detonating the bomb. What to do? If you chose “all of the above”, you are going to love this film! The installation of special phone booths allow people to call Puli’s team direct and report their law and order problems. On receipt of a phone call from the special “Bat Phone”, Puli and team leave their high tech HQ and seem to be able to arrive anywhere in Hyderabad within mere minutes – another tipoff that this is fiction, as we all read the endless tweets about celebs stuck in traffic in Hyderabad. They start to beat the corruption out of the force – literally. In addition to this, Puli Force are on the trail of a terrorist master-mind called Nixon, and local crimelord Saleem, Manoj Bajpai back on the scene, this time in a distinguished grey wig and moustache. Oh, and there is always time for romance. Especially when the girl is a crazy stalker with a theatrical streak and your mother approves of her. Puli never stood a chance once Nikesha Patel and her friends decided he was the one for her. Right down to the most bizarre marriage ceremony, he is railroaded by the women in his life, but its all for his own good. Now that love has kindly provided a likely target for hostile forces, a romantic night at home is rudely interrupted by vampire ninjas in V for Vendetta masks. The outfits are never explained, but neither are many other things. Deal with it. We did. The film has many heroic dialogues. 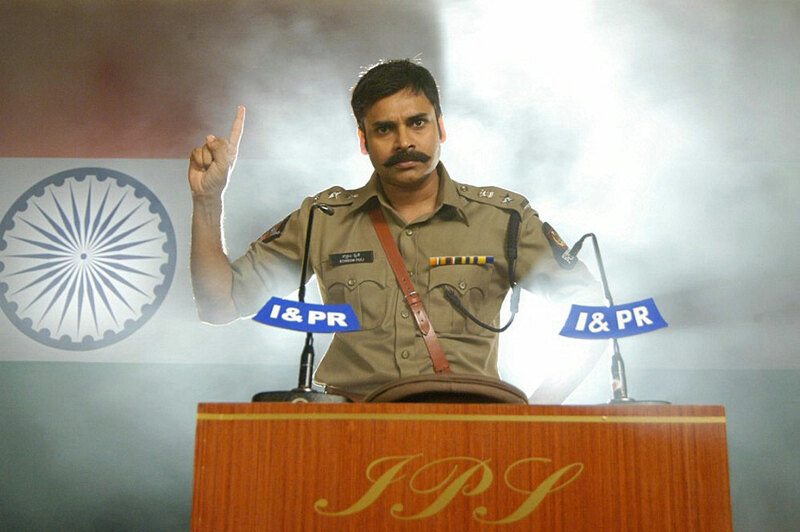 Every time Pawan Kalyan brandished his index finger towards the camera, the audience went wild. We will never know what exactly his message was, but we are pretty sure no one else could hear it either. Now THAT is star power! Unlike so many other filmi mothers, Saranya played an important role in the action. She was no passive victim standing on the sidelines and weeping for her boy. She delivered powerful and moving dialogues and was clearly the strength behind her son. And never, ever discount the power of a mother’s tear. While overall we found this highly entertaining, the film does have serious flaws. The songs seem to be misplaced in the narrative and this gives the feeling that the film is disjointed. The climax is muddled by having two villains and apparently running out of a plot for one of them. The final confrontation between Puli and Saleem is very heavy on the dialogue and slows the conclusion of the film down. However, the final few frames are truly amazing and left the audience stunned (although still screaming). This was our first taste of Powerstar Mania and it was just awesome. The screaming, cheering and applause never stopped right til the very end. Which, we will remind you, was at 2:00am. While we would give the film itself 3 and 1/2 stars, we give the audience 5 stars! This entry was posted in Tollywood and tagged A.R. Rahman, Adventures without subtitles, Komaram Puli, Manoj Bajpai, Pawan Kalyan, Powerstar, Saranya, Telugu, Tollywood. Bookmark the permalink. Between you and Pitu, my life is now spent wandering dark alleys of the internet. Hello, Pawan Kalyan, I foresee a beeyooteefool friendship. Great review! It sounds like a really great and mind-expanding evening. 🙂 Would love to hear some chants sometime!! The other great classic that you should see is Malleeswari, starring Bhanumathi and NTR. Its songs are still loved nowadays, and it was another magical coming together of many great talents, not only its stars, but its director, B.N.Reddy, its music director, S. Rajeswara Rao, and its lyricist, Devulapalli Krishnasastri, a very renowned poet. I think there is a version with English subtitles, but even without them, I am sure you will enjoy it. The only down side is that the dvd I saw several years ago had some scenes cut out; I don’t know if there is any other version available now. Oh, and if you’ve become a fan of Savitri, you should see the Telugu Devadasu, with Savitri and ANR, and Kanyasulkam, with Savitri and NTR (the latter was based on a very famous play about getting rid of a major social injustice). Sorry, I don’t know if these are available with subtitles, but they may be now. You’re welcome. I’m sorry, I meant to put those last two comments in the Maya Bazaar thread, and thought I was doing so! Sorry again. No problem 🙂 And no need to apologise – we appreciate you taking the time to read our stuff and think of more films for us!